Microsoft OneDrive is a cloud-based storage and syncing solution that works on Macs, PCs, and mobile device with access to the internet. After you install Office 365 with OneDrive on your Mac, it appears to be just another folder. Drop a file or folder of any type into the OneDrive folder, and the data is immediately stored on the OneDrive cloud storage system. OneDrive is included with all Office 365 paid subscriptions. You can also access your OneDrive content using a web browser Browser-based access allows you to make use of the cloud-based storage on any computing platform you find yourself using without having to install the OneDrive app. OneDrive from Microsoft may seem like an odd choice for a Mac user to use to store data in the cloud, but there's no reason not to use it. Free OneDrive plans include a free 5GB and paid plans include even more. OneDrive can be used along with other cloud-based storage services, including Apple’s own iCloud service, Dropbox, and Google Drive. There's nothing to stop you from using all four and taking advantage of the free storage tiers offered by each service. OneDrive currently offers several tiers of service, including plans that are paired with Office 365. For OneDrive to work, you need two basic items: a Microsoft account and the OneDrive for Mac application. Both are free. If you don't already have a Microsoft ID, go to the Microsoft ID signup screen and select No account? Create one! Supply the requested information and create a password. Before you know it, you'll have a new Microsoft ID. Go to the OneDrive website. Click the Sign In button and enter your ID. Your browser will display the default OneDrive folder configuration. Go to the bottom of the sidebar and click or press Get the OneDrive App link. Click the Download button to download OneDrive for Mac. Open your Mac's downloads folder and double-click the OneDrive.pkg file. 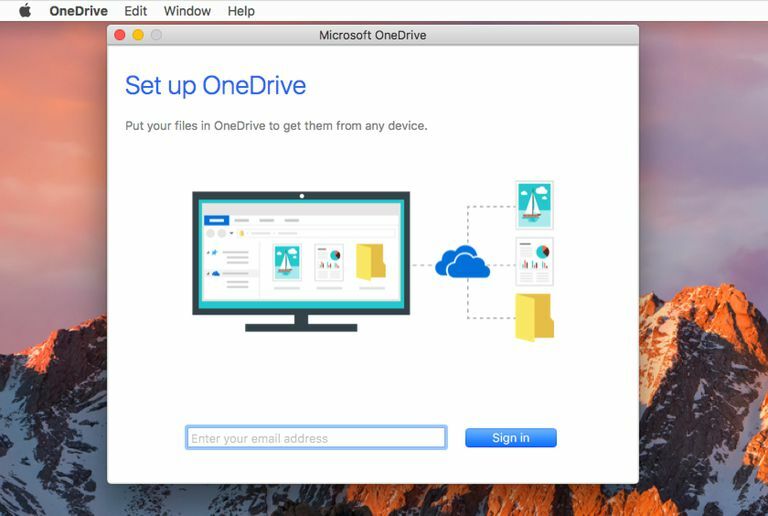 Follow the on-screen instructions to install the OneDrive application on your Mac. OneDrive acts much like any other folder on your Mac. The only difference is that the data within it is also stored on remote OneDrive servers. In the OneDrive folder are three default folders labeled Documents, Pictures, and Public. You can add as many folders as you want and create any system of organization that suits you. Adding files is as simple as copying or dragging them to the OneDrive folder or appropriate subfolder. After you put files in the OneDrive folder, you can access them from any Mac, PC, or mobile device that has OneDrive installed. You can also access the OneDrive folder from any computer or mobile device using the web interface. The OneDrive app runs as a menu bar item that includes sync status for files kept in the OneDrive folder. There is also a set of preferences you can adjust by selecting the OneDrive menu bar item and clicking on the gear button. You're set up and have 5GB of free space to use.